Five Torah scrolls stolen from Jaffa synagogue found in Hevron. Israeli police say PA authorities aided in recovery of holy items. Five Torah scrolls were stolen from a synagogue in Jaffa over the weekend – only to be returned shortly afterwards, thanks to the cooperation of Israeli police and local Palestinian Authority forces in the city of Hevron, south of Jerusalem. Torah scrolls, which are written out meticulously by hand by Torah scribes (sofers), cost tens of thousands of shekels to produce, and are frequently targeted by thieves. Arab thieves operating in Jaffa, part of the city of Tel Aviv, stole five such scrolls from the Beit David synagogue on Bikkurei Tzion Street over the weekend. 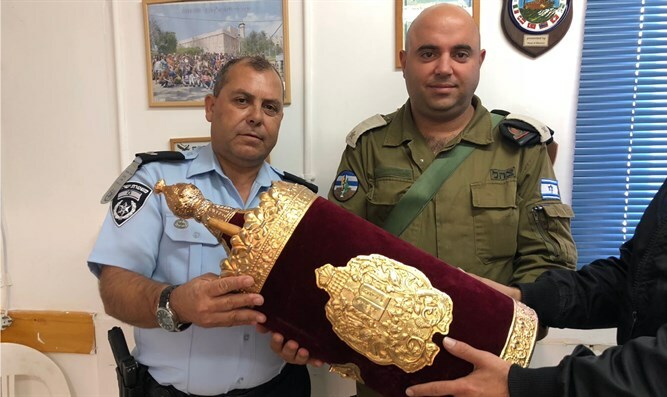 After Israeli police were notified of the theft, Israeli authorities contacted PA security forces, who helped locate the stolen religious items in the city of Hevron, some 45 miles away in Judea, south of Jerusalem. Chief Superintendent Danny Yisrael, who oversees all joint operations between Israeli police in Judea and Samaria with PA security forces, said the return of the holy items reaffirmed the importance of cooperation between Israeli and PA authorities.